Many people enjoy having these quick flying little visitors. Putting out a hummingbird feeder will help attract them to your yard. 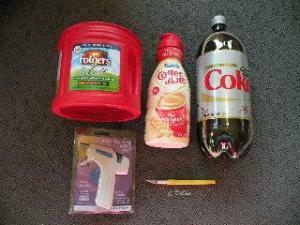 This is a guide about making a hummingbird feeder. Often my hummingbirds visit before the flowers are out in bloom. Sometimes they need a little extra help remembering where the feeders are. I use the silk and plastic Poinsettia flowers from my outside Christmas decor to help them spot the feeders. I either fasten the flowers to the pole that the feeder is on or I weave them to the wire fence nearby. The extra bright colors draw the little hummers in to a fresh and tasty snack. By the time the hummers have been here all summer, the flowers have faded a little so I purchase one or two new Poinsettias to add to the Christmas decor the next winter. Usually I buy these at the local dollar store. I have had several comments of the "varied coloring" of my special Poinsettia decorations! It usually takes four or five years before I actually have to throw any of the Poinsettias away. I frequent a hummingbird forum. On it, there is a photo of a feeder where someone used a Frisbee at the top of the feeder to shade it. It's a great idea and saves buying the expensive ones. Is it OK to paint the feeder if you stay 3/4" from the feeding tube? Thank you. Why do you want to paint the feeder? OK-but only if the paint is completely non-toxic to hummers, is more than two feet from any opening that is used to pour the food in and the hummers touch. That is, no paint at or near the perch, feeder tube and body, inside and out, and any other areas of the feeder. I belabor answering your question because when you clean the feeder at least every four days, there is the definite probability of getting even a tiny little bit of dried paint residue into the hummer food. And, even a tiny little bit hurts a tiny little bird, very much so! I'm looking for ideas on how to transform jars or wine bottles into hummingbird feeders. Any ideas on how to decorate the glass would be great and ideas on where to get the feeder tubes and how to secure them to the jar lid would be great too. Thanks! I want to make hummingbird feeders. Where do I buy the cork part the bird feeds out of? I have made these hummingbird feeders before, but the copper tube that is at the bottom with the flower attached sometimes leaks. I must not be bending it right. Does anyone have a pattern I can print out so I can bend it exactly? Please and thank you. I want to give gifts for Christmas and want to make hummingbird feeders from bottles. I need to know, can I make my own feeding tube or do I need to buy them? Thanks. 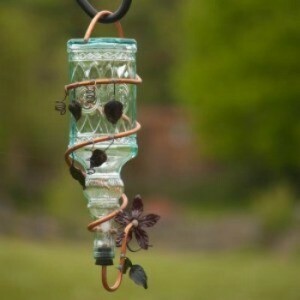 How do you make a hummingbird feeder from recycled plastic bottles? I have seen hummingbird feeders made from 2 litre pop bottles. Does anyone know how it is done? There is actually a kit you can buy to convert a 2 liter bottle into a feeder. The brand name is Gadjit. If you Google it, you'll see what I'm talking about. You can also buy hummingbird feeder "tubes" that you can put into any bottle-type container. They look like a cork with the familiar tube that the hummers feed out of. How do I make a Hummingbird feeder? Red Folger's coffee container, 29.2 oz. Cut circle from bottom of Folgers coffee container. Cut circle in center of bottom of Folger's coffee container. Inner circle is the size of CoffeeMate cap. Remove cap and label from 32 oz. Coffeemate container. Remove black stamped date with nail polish remover. <l>Place cap from Coffeemate container firmly into hole of Folger circle. Hint: If hole is too small, make 1/8 inch cuts 1/8 inch apart around inside of circle. Glue cap from Coffeemate container into hole of Folger circle. Cut bottom off at line of plastic 2 liter soda bottle. Cut 5 tabs and fold inward. Look at the 5 wells formed in bottom. Cut the tabs in between the wells. Cut 5 tabs and fold inward. Cut remaining 5 tabs each into 3 tabs and fold outward. Place Folger circle on top of soda bottle bottom. Glue Folger circle to top of soda bottle bottom. Place glue on each tab. Hint: Use clothespins to hold one half while gluing other half. Center hole in Folger circle above well in soda bottle bottom. (total 5 holes). Optional - Recycled plastic to make decorations. I can't afford to pay $10 or more each for Hummingbird feeders. I would like to find an economical way of making my own. How do you make a hummingbird feeder?